Just the Facts: by Alex Haley. 729 p. Published 1976 by Dell Publishing. Bought used at a library sale. Short Bio: Kunta Kinte grows up from a young tyke into a strapping young “man” of 16 when he is suddenly captured and taken via slave ship to Maryland. After three escape attempts, he finally resigns himself to his new status as property but determines to pass on the pride and dignity of his African heritage to his daughter, Kizzy. The author traces the oral history of Kunta’s descendants six generations until he reaches his own birth. The history of Haley’s family includes such extraordinary characters as Gran’mammy Kizzy, preacher-girl Mathilda, Chicken George, blacksmith Tom Lea, and lumber mill owner Walter Palmer. Eyewitness Account: At the beginning of the year, I made a list of about 20 classics that I hadn’t yet read that I’m trying to get through in 2011. This is one I was really excited about – and it didn’t disappoint. Haley’s perfect combination of rich detail with gripping plot and fantastic characterization make for an excellent (though sometimes heartbreaking) read. He spends a good majority of the book on Kunta Kinte – about half of that in Africa (I nearly died of anticipation, I kept expecting him to get snatched and he didn’t leave Africa for at least 160 pages!). At the end of the book, Haley explains how he backtracked to find where his ancestors came from and located the very village – how incredible! Don’t be intimidated by the length – Roots is jam-packed with interesting historical/cultural detail among a suspenseful plot and colorful people. I practically felt myself the incredible pain and humility that Kunte experiences as he crosses the Atlantic in a crowded ship, the desperation that drives him to attempt escaping multiple times (despite severe beatings as punishment), and the utter bewilderment he feels toward his fellow slaves who accept their shameful lot so willingly. By the time I read through most of Haley’s family history and got to the end of the Civil War, I was ready to whoop with glee when Tom and all his brothers finally got to live as free men. 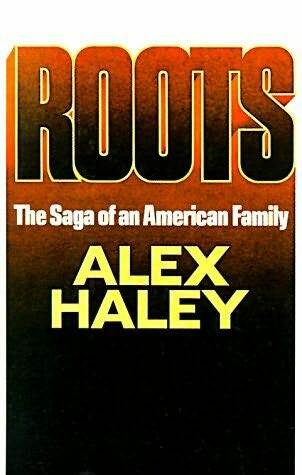 But my favorite part of all is the end, where Haley describes his own journey of discovering just where his great ancestor Kunte Kinte was from and how he got to America. Well done, Haley! This is probably one of the only books I’ve given all 5-stars to.